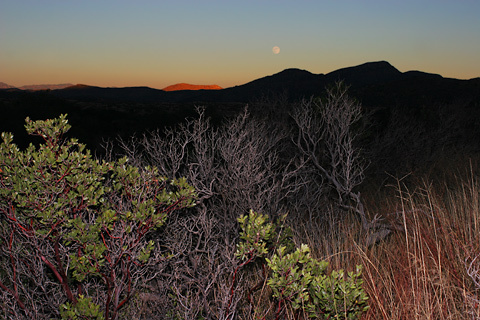 One of my favorite times of the day to go walking or exploring here in southeastern Arizona is the time just before sunset until the final lingering glow of twilight fades into darkness. At this time of day, the light takes on a beautiful, magical quality and there is still just enough light to spot nocturnal creatures as they begin to emerge. When there are a few clouds to catch the sunlight, Arizona sunsets can be quite spectacular, however, even a more subdued and mediocre sunset in a clear, cloudless sky can still work magic with its dying light. 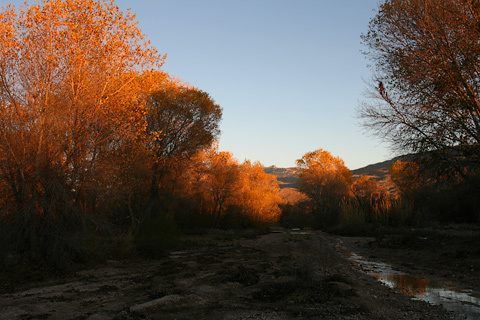 As the sun begins to slip below the hills, the crowns of taller trees like these Fremont Cottonwoods (Populus fremontii) remain bathed in the sunlight, while their trunks are already deep in the upward-creeping shadow of the horizon and nearer objects. All of these photos were taken here during November and December. 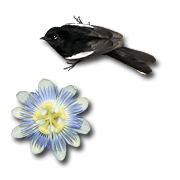 When the weather is clear at this time of year, the temperatures can drop rapidly as the sun sets and nighttime freezing temperatures are not uncommon. As the sun slips even lower in the clear sky, only the distant mountains to the east remain sunlit. If the moon is visible in the eastern sky, it will begin to glow as the sky darkens around it. 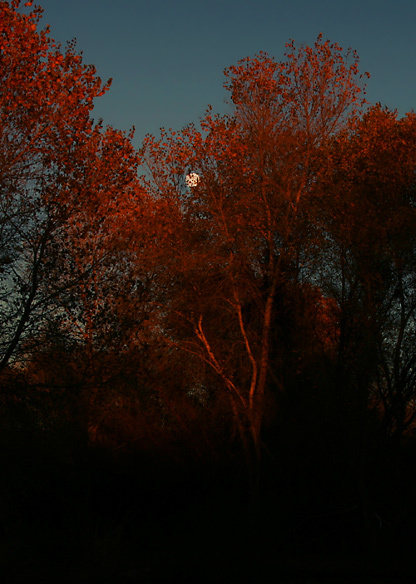 Above, a grove of Fremont Cottonwoods are bathed in the dying light of a blood-red sunset as the full December moon shines in the eastern sky. 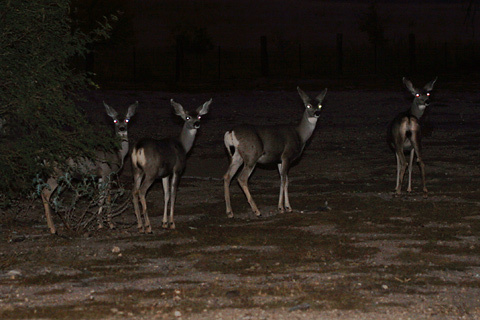 During this transition from day to night, nocturnal birds like owls and crepuscular animals like these Mule Deer (Odocoileus hemionus) become active. We spotted this twilight herd of Mule Deer grazing inside of a horse pasture in the eastern foothills of the Rincon Mountains here in Arizona. During the daytime, we saw very few deer in the Rincons, but as the sun set, deer suddenly appeared everywhere as if by magic. 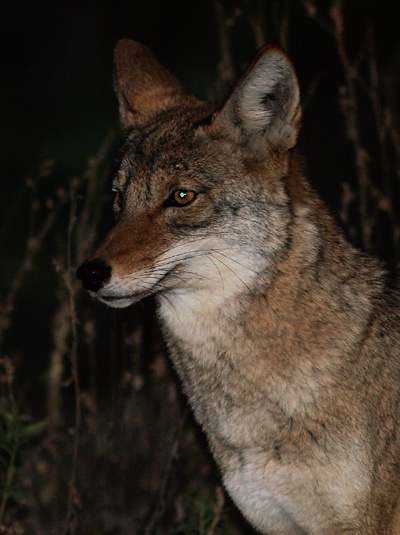 The glowing eyes of deer are not the only ones to appear in the fading twilight, the glowing green eyes of Coyotes (Canis latrans) can also commonly be seen. Like deer, Coyotes are also primarily crepuscular, and although I have seen them at all times of the day and night, twilight is definitely the best time to see Coyotes here. Most of the Coyotes that I see during the daytime are either solitary or in pairs, but I have seen Coyotes gathering in large, excited packs just after sunset, nipping, chasing, and playing with each other before heading off together for the hunt. As the twilight fades into true darkness, only their howling gives away the pack's presence.